Four successful alumni from the Department of Media, Journalism & Film (MJF) offered current Miami students their wisdom and inspiration for life-after-college. The event was held March 5 in the Williams Hall studio. The four panelists of MJF Distinguished Alumni Days included Steve Susi ('93), executive creative director at Omnicom agency Critical Mass; Mary Patrick ('93), CEO & managing partner at Jasculca Terman Strategic Communications in Chicago; Jeremiah Shuff ('98), post-production editor for Saturday Night Live; and David Spunt ('07), reporter for CBS3 in Philadelphia. Alicia (Fronckiewicz) Elsner ('95), the general manager of KSDK, the NBC affiliate in St. Louis, was the fifth honoree but was unable to attend because of illness. 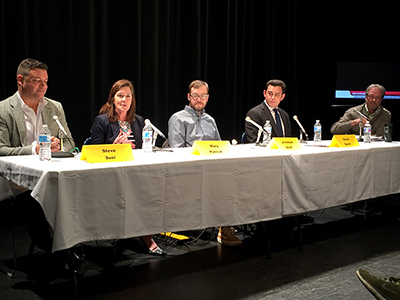 The panel was part of the Department of Media, Journalism & Film's Distinguished Alumni Days, in which the department invites 5 of its graduates to campus each year to attend classes and share their experience in the media world with students. With the alumni's jobs centering around media, journalism, and film, the past 10 years have changed dramatically as the world became increasingly dependent on technology. The alumni discussed how social media changed their careers. Steve Susi started the discussion by saying that social media is a powerful force but needs to remain authentic. Having joined Amazon's advertising division in 2012, his last 6 years have been focused on economy-based advertising which deals with utilizing social media. "[Social media] enables companies a much deeper look into a body consensus to millions of people because data is constantly being captured, analyzed, and sold," he said. However, he added, it's important to be careful with what you're doing on social media since there is no definite answer it will end up. Mary Patrick said that social media provides a new way to communicate and has altered the way people use traditional media. Although she used to announce the news in a news conference, news comes so fast that much more content is online. It also shapes what time of the story is being told. "If it's not destruction or breaking news, it becomes hard to tell your story," Patrick said. Creating a bigger story with background information takes more time to write, which is why it might be pushed aside for a shorter, faster story ready to be put online. While it has changed storytelling, she said, it has also become a great engagement tool to make connections, hear feedback, and shape a client's story. For Jeremiah Shuff, when it comes to entertainment, social media can make a single video go viral overnight while also providing critique. "Social media is effective for SNL skits because it allows for immediate feedback from the audience — whether the skit was well-received or if the topic is something that can be joked about," he said. While Shuff said he doesn't like how disposable things have become, he appreciates the challenge to overcome and adapt. Working closely with news sources, David Spunt stressed how viewers should be careful, because many users on social media outlets post false new sources. Even on Twitter, it can look like a legitimate news source but often isn't. Spunt explained that his job can be difficult as a reporter because people can hide behind facts and are anonymous. Social media has also changed the timeliness of the news. Now a whole story might already be online by the time he goes on air, so it's figuring out ways to show a new perspective on the story. However, he admitted that he doesn't know all the ropes of social media. "With social media, we’re still learning what it all means, so don't lose the core skills of reporting," he said. The four alumni then spoke how they have gotten to where they are in life, and how students in the room might achieve the same status one day. Spunt said he did everything he could get involved in at Miami, but the organizations were always related to reporting. He spoke of how it's important to be aggressive and assertive but in a positive way. "It's essential to engage with people, because it will pay off in the end," he said. "Face-to-face meetings and calling make a student stand out compared to someone who just emails, and after talking to someone always follow-up." He added, "Be yourself — be present — listen to people — don't look at your phone!" Patrick's tip was to make yourself indispensable, whether that means staying late, asking to take on more responsibility, or speaking out to show your creativity on projects. "Take on as much as you can, and demonstrate your passion for your work," she said. It's all about making yourself stand out to everyone at the company, and for them to know that they can't lose you, Patrick explained. She spoke about how every detail matters right down to spelling someone's name right. Susi's advice was to prepare. "Prepare better than anybody else you're up against and show your dedication," he said. "It's your job to make the company realize they are a lesser organization if they didn't hire you." After he graduated, Susi filled his time doing something creative. Even if it's not something you want to end up doing, fill your time in and get the experience. "Overdo it and you'll win every time," he said. Shuff, a more inverted personality, said that he lets his work stand for itself. If students are going into production, people will want to see what you've done, so coming out of school there are no limits. After he graduated, he started his first job editing Watson advertisements. "Even though it was an uncreative process, I strived to be as efficient as possible, because it was practice for what I eventually wanted to do," he said. "It's also about finding a way to stand out and prove yourself." He added that whether it's a commercial for a product, a music video with your friend's band, it's important to prove you're interested in creating. "If you have ideas, realize them," he said.